Royal & Langnickel Premier Artist Brush Collection- 72 Majestic Watercolor Brushes - Royal & Langnickel Premier Brush Collection- Majestic Watercolor Brush Assortment- This mega pack of brushes includes 72 assorted Majestic Watercolor Brushes by Royal & Langnickel. You get 12 each of #4 fans, #3/0 and #1 rounds, #8 filberts, 1/2 inch angulars, and #20/0 liners. This set is perfect for teachers, workshops, and classes! 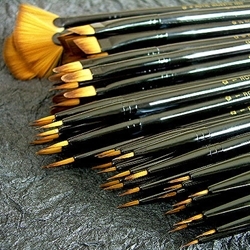 The price per brush comes out to be a mere $1.80 each. The sturdy synthetic bristles will also work perfectly with acrylic paints and most liquid inks. The brushes come in a re-usable cardboard box so that you can keep them sorted.